On April 30, Boy Scout Troop 50 bestowed the Boy Scouts of America’s highest rank during a ceremony honoring Creighton Wesley Wilson Williams. He appeared before the Saugahatchee District’s Eagle Scout Board on Jan. 24, becoming the troop’s first Eagle Scout of 2017 and its 13th since its founding in 2012. Lead Troop Guide Louie, who has served in various youth leadership positions with Creighton throughout their time in the troop, called the court of honor to order with the presentation of the flags and the recitation of the Pledge of Allegiance, Scout Oath and Scout Law. Michael Tullier, the troop’s chartered organization representative, welcomed everyone as the master of ceremonies. Rev. Charles Cummings, Auburn United Methodist Church’s associate minister, offered an opening prayer, and Saugahatchee District Committee Chair Julie Hoff offered greetings from the district and council. from his uncle, Gary Williams. 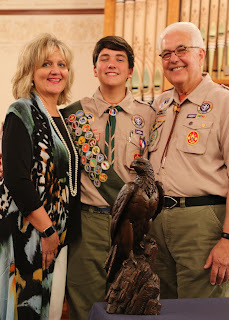 In addition to the traditional elements of an Eagle Scout court of honor, Creighton’s ceremony featured family, friends and relatives with Scouting backgrounds—each of whom offered Creighton both congratulatory remarks and reminders of the seriousness that comes with wearing the Eagle Scout badge. These individuals included Ross Reed, principal of Auburn Junior High School, who earned the Eagle Scout rank in 1986; Matt Clegg, a former neighbor of the Williams family, who earned the Eagle Scout rank in 1990; and Gary Williams, Creighton’s uncle, a former Scout, and immediate past council president and current national council representative for the Palmetto Council based in Spartanburg, South Carolina. The ceremony also included founding Troop 50 Eagle Scouts Davis Baird (Eagle Class of 2011), Andrew Stanford (Eagle Class of 2015) and Davis Tullier (Eagle Class of 2016). Eagle Scout medal on his uniform shirt. Scoutmaster Andrew Baird issued the Eagle Scout Promise to Creighton, who was joined by other Eagle Scouts in attendance. He then received from his parents his Eagle Scout medal and Eagle Scout neckerchief slide, and in return, he presented Eagle Scout mother and father pins to his parents. Troop Committee Chair Rob Stanford presented Creighton with several additional recognitions. These included membership in the National Eagle Scout Association, sponsored by Troop 50, as well as a certificate of recognition from the Sons of the America Revolution (of which Creighton’s father and uncle are members), and congratulatory correspondence from U.S. Senator Richard Shelby and U.S. Representative Mike Rogers. City of Auburn Mayor Pro Tem and Ward 2 Councilman Ron Anders added to the special commendations by presenting a proclamation declaring Sunday, April 30 as “Creighton Wesley Wilson Williams Eagle Scout Day” in Auburn. "Creighton Wesley Wilson Williams Eagle Scout Day" in the City of Auburn. with one of the five mentor pins he awarded. Creighton, the son of Wes Williams and Sara Doornbos of Auburn, previously served the troop as an assistant patrol leader, patrol leader, troop instructor, troop guide and senior patrol leader. He currently serves as the troop’s junior assistant scoutmaster and will serve as senior patrol leader for the Chattahoochee Council’s 2017 National Jamboree contingent. To date, he has earned 26 merit badges and accrued more than 50 nights of camping, 100 hours of community service, 40 hiking and backpacking miles, and 15 paddling miles. In 2016, he completed the Boy Scouts’ National Youth Leadership Training, a six-day course equipping Scouts with leadership skills and experience applicable to both Scouting and personal situations. For his Eagle Scout leadership service project, Creighton and the volunteers he led accrued 182.5 volunteer hours enhancing the Auburn Celebration Grove at the City of Auburn’s Kiesel Park. Together, they established a new trailhead and installed an informational kiosk. 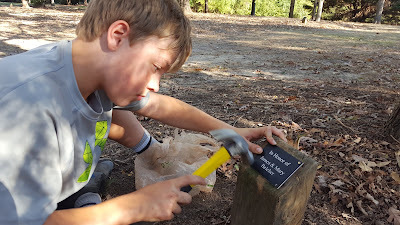 They also created a navigational system that includes new tree plinths and a corresponding web page listing the trees that comprise the Auburn Celebration Grove and those for which the trees are named, a dedicated geocache, and new benches for relaxation and mediation. Eagle Scout Leadership Service Project at Kiesel Park. Currently, Creighton is an eighth grader at Auburn Junior High School. This summer, in addition to attending the National Boy Scout Jamboree at The Summit Bechtel Family National Scout Reserve in West Virginia, which will attract more than 40,000 Scouts and leaders, he will participate in a 12-day backpacking expedition at Philmont Scout Ranch, the Boy Scouts’ largest national high-adventure base, which is located in Cimarron, New Mexico. Since the first Eagle Scout was awarded in 1912, more than 2.5 million Boy Scouts have completed the Eagle Scout’s performance-based rank requirements, which currently include serving in progressive leadership positions, demonstrating outdoor and Scouting skill competencies, earning at least 21 merit badges, and planning and executing a seminal Eagle Scout leadership service project. Less than 2 percent of all Boy Scouts complete the requirements for the Eagle Scout rank. 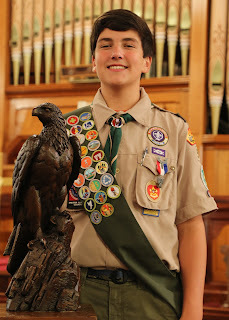 For more photos from Creighton’s Eagle Scout court of honor, please visit the troop’s online photo album.